Hunting has long been seen as a key human adaptation, thought to have influenced our anatomy, physiology and behavior. Humans have been hunter/gatherers for most of our existence as a species; only today are the last hunter/gatherer cultures being lost. However, there is considerable uncertainty about where, when, why and how our early ancestors came to consume vertebrate meat on a regular basis. Cutmarks on fossil bones are open to multiple interpretations (for example, were processed carcasses hunted or scavenged?). We can look to our closest relatives, chimpanzees and bonobos, for clues – but surprisingly, there is still significant uncertainty about why chimpanzees hunt, why it is usually a male activity, or what explains dramatic differences between populations in rates of meat consumption. 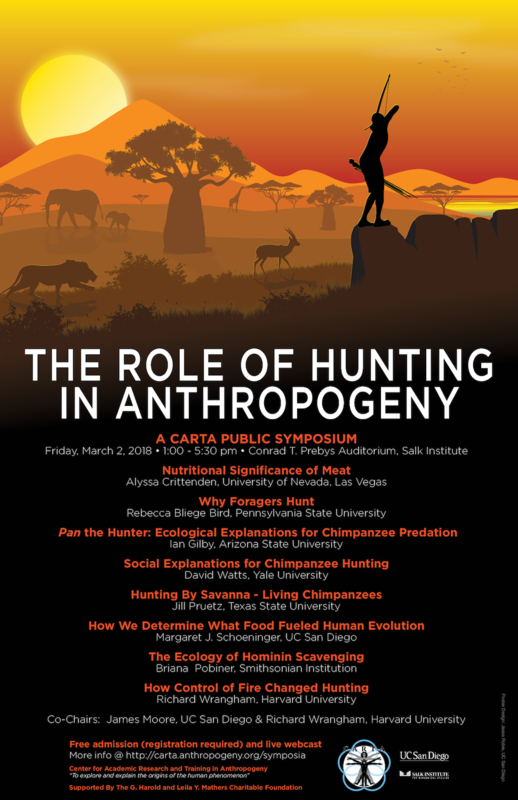 The goal of this CARTA symposium is to explore evidence pertaining to understanding the origins of hominin hunting in an attempt to focus research agendas for the future. A glossary for this event is available as a Searchable List and a PDF.